Casino.com is a leading international online casino with dedicated sites for various regions including Europe, Australia and Canada. The brand originally launched in 2008 and has become one of the top choices for Canadian online gamblers. Unlike many other premier online casinos for the Canadian market, Casino.com does not use Microgaming as their key software supplier. Casino.com decided to go with Playtech instead, the second oldest online casino software brand after Microgaming. Casino.com online casino offers Canadian players the opportunity to play a range of top Playtech games, including slots, progressive jackpots, video pokers and table games, all in CAD. The brand also offer a good selection of Canadian-friendly payment options, 24 hour customer support in English and in French and a solid sign up bonus, also in CAD. Casino.com is registered and licensed by the Malta Gaming Authority and features the latest SSL digital encryption for total online safety and security. Casino.com launched with Playtech branded software in 2008 and has never looked back. While perhaps not quite as popular as Microgaming in Canada, the brand has a great deal to offer Canuck online casino gamblers. Currently Canadians will find over three hundred of the best casino games available. The range is extensive and can easily go head to head with the best Microgaming casinos on the net. While the majority of the Playtech games that are available at Casino.com are indeed video slots, the casino brand also offers much more than that. Fans of progressive jackpot games will find plenty to choose from here, including Playtech’s much talked about Marvel Comics progressive jackpot series. The Marvel Mystery progressive jackpot network is one of the biggest in the industry and spans hundreds of top Playtech-powered online casinos. A top feature of the Marvel progressive jackpot games is that they feature four separate progressive jackpot totals per game. This makes them one of the most lucrative of all online casino progressive jackpot games. Aside from the extensive range of video slots, progressive jackpot games, video pokers and table games, Casino.com also offers an excellent live casino. The live casino features a range of live table games, complete with real live dealers which is streamed in real time in HD to your desktop. Casino.com offers Canadians a substantial Welcome Bonus package when they sign up for a free Casino.com player account. The entire sign up bonus package is divided over several initial deposits which gives new players a more sustained starting campaign with Casino.com. The entire deposit bonus package is worth a total of CA$400, with the first deposit bonus consisting of a 100% deposit match up to CA$400. The rest of the sign up bonus package is then divided over several follow up deposits. Each with their own deposit match percentage amount. The entire Casino.com Welcome Bonus package is also available for mobile players and can be accessed easily from several mobile operators. The sign up bonus from Casino.com is by no means compulsory and new Canadian players can choose to accept it or play without a bonus at all. Players that do decide to take up the bonus offer need to indicate this after their first qualifying deposit into their player account. This is done by ticking accept in the space provided in the pop up window that appears after your initial deposit. Upon accepting the bonus offer, players will then also need to be aware that they need to adhere to the bonus terms and conditions. This includes completing the required play through requirements which have been stipulated in the terms and conditions. The Casino.com Welcome Bonus requires players to meet a forty (40) times wagering requirement before they are eligible for any withdrawals from their player accounts. Casino.com allow the majority of their Playtech games to be used to complete their wagering requirements. There are however a few exceptions. These are games that do not count toward play through requirements. It is important to note these games when attempting to complete wagering requirements, as playing them will not affect the amount of wagers needed to be completed. Casino.com uses the latest in HTML5 mobile casino games browser technology to present a highly competitive mobile casino. The Casino.com mobile casino platform is powered by Playtech and offers exactly the same user experience that Canadians can enjoy with the full download or desktop Instant Play (browser-based) versions of the casino. The Casino.com mobile casino works brilliantly across all operating systems including iOS, Blackberry, Android and Windows Phone. The mobile casino is also optimized for smaller mobile screens and looks great on most smartphone and tablet screens, particularly higher resolution HD-enabled screens. While most players will find it quick and easy to simply navigate to the Casino.com website from their mobile device, it is also possible to simply download the dedicated app for your particular device operating system from the appropriate app store. Canadians can also sign up for a new Casino.com account from their mobile device and the process is just as easy and just as quick to complete. Once signed up from your mobile, you will also be able to make safe deposits via a range of Canadian-friendly payment options. This means that the same Casino.com Welcome Bonus of CA$3200 is available via mobile sign up too, giving you the best possible player experience. Casino.com offers a range of additional bonus and promotional offers to all of their players, new and existing. One of the most popular Casino.com promotions is their very own in-house game called “Jack Potts”. The idea behind the game is to give all Casino.com players the chance to win prizes by looking out for the casino brand mascot named Jack Potts. The mascot can appear at any time and even during games. Casino.com reward loyal players in a variety of ways. The Casino.com loyalty rewards points program rewards players that play at the casino often. Every game played will award a certain number of points and the more you play the more points you can earn. Once players have accumulated a fair amount of points, they can exchange them with the Casino.com cashier for real casino cash. This is then deposited into their player accounts, giving them an instant free bonus boost. Casino.com offers comprehensive customer support through a number of effective communication channels. The Casino.com support staff are friendly and highly trained and are available 24 hours a day, seven days a week throughout the year. The fastest and probably most effective way to get in touch with casino support staff is via Live Chat. This facility is available on ever casino page and clicking on the Live Chat icon will bring up a chat window within seconds. Players can also contact the casino via email or landline call. New players can consult a very comprehensive FAQ section which answers most casino questions. 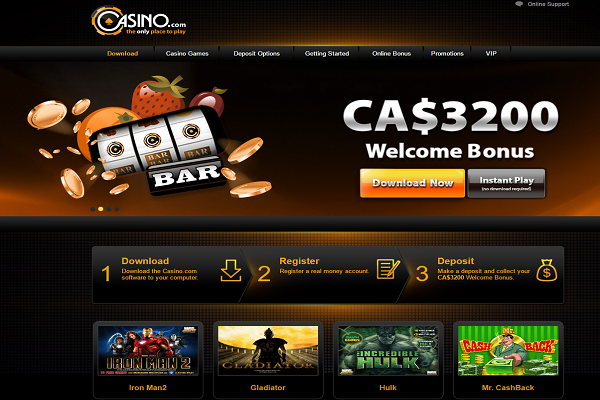 Canadian players can enjoy a wide variety of great payment and banking options at Casino.com. 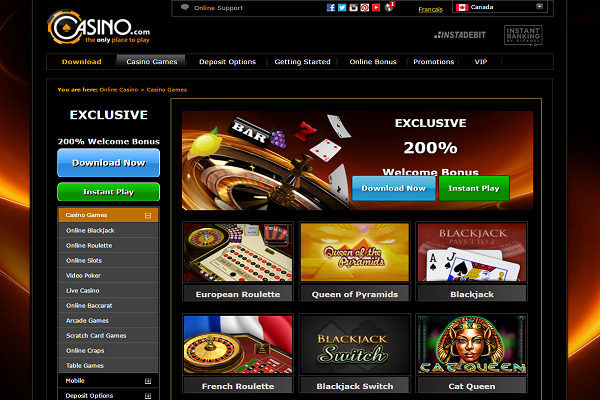 The casino offers a dedicated platform for Canadian players which includes banking in CAD and Canadian preferred payment methods. Initial withdrawals can take a bit longer due to the compulsory verification processes. However, once new players have submitted a valid driver’s license and utility bill, the process can be completed in under 72 hours. Generally, the casino processes payouts fairly quickly, usually within 48 hours. There are of course additional waiting times depending on the actual payment option selected. Casino.com use the latest SSL encryption protocols to ensure that all transactions are safe and secure through complex encryption algorithms. This is the same sort of digital security that us uses by all online financial institutions. Casino.com is a reliable online casino option for Canadian players. The brand are also a great alternative to Canadians that are not necessarily big fans of Microgaming branded online casinos. Casino.com offer an extensive range of Playtech games, along with multilingual 24 hour customer support, excellent banking, live casino gaming and mobile gaming.